We need an implementation that supports authentication ONLY (no authorization, encryption is nice to have). One of our initial adopter products has a web service that needs three parameters: login, password, and the (graph) query string. We need to add login-id/password support to COSMOS. Please note that this part of Security implementation will be completed by November 2008. Description: The COSMOS application needs to provide a login-id and password to a non-COSMOS MDR before it can fulfill queries / registration / deregistration. The login-id and password does not need to be encypted. COSMOS Application receives the authentication credentials from the User. COSMOS Application passes on these credentials to the non-COSMOS MDR along with with the query or registration request. COSMOS Appliction notifies the user in case of invalid credentials. Otherwise, the request is fulfilled. Description: The COSMOS end user utilizes the COSMOS webUI to interface with the various services provided by an MDR or non-MDR. Each request to a MDR or non-MDR may require authentication. It should be possible to group requests to a particular authentication session. For example, requests to view service meta data and submit CMDB queries to a specific MDR can use the same authentication credentials. The user should not be prompted each time a request is sent to the MDR. Application obtains the username and password from the user. Application initializes the COSMOS client CMDBf Query (or Registration) Service with the endpoint of the MDR (obtained from the Broker). The COSMOS CMDBf Query (or Registration) Service constructs a request with a SOAP body that contains the query. If the username/pasword was supplied, it adds a SOAP header to the request containing the username/password values. It sends the request to the MDR endpoint. The non-COSMOS MDR authenticates the request using the username/password in the SOAP header. Each client application is responsible for obtaining the username and password values from the user. Subsequent requests should not prompt the user for the same username or password. Outputter - service side java component that receives the request and generates a response. Notice the a query object is constructed and passed to the UIContext class. 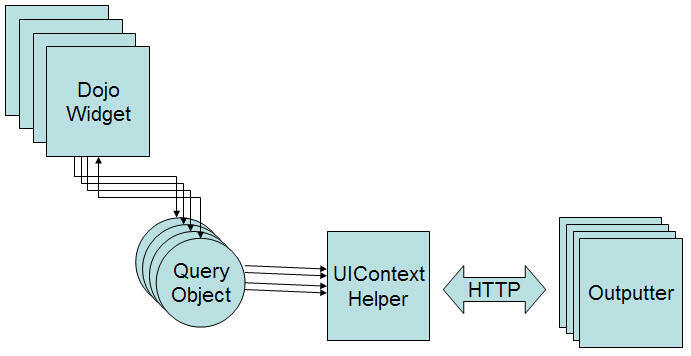 The UIContext will process the query object and send a request to the server component. The server component will return a response. The response will be sent to the query object and eventually returned to the dojo widget. The query objects decouples the binding logic from the ui widget. We can make use of this architecture to prompt the user for a password and username before submitting a request to the server. We can define the following security object that will bind the security credential to the request. Note that the password should be encrypted before binding to the request. //return true if the security object should bind credentials to the request otherwise false is returned. Lets go through the steps to understand how the each component interacts with one another. Consider the case when the end user wants to submit a CMDBf query to the Example MDR. Note that a security object is registered with the COSMOS UI. The security object runs its "canBind" function to determine if the user should be prompted. A dialog box is prompted to the user to enter the user name and password. The dialog box also adds an option to save the username and password so that the dialog box is not prompted after each request. Note that the Security object will save the username and password in memory. The password is encrypted using some form of encryption (e.g. MD5, etc.). The user name and password is also bounded to the query object request. The HTTP request is received. The password is decrypted and used to authenticate the request. A return response is generated and passed back to the client. The widget renders the response. A set of security objects can be registered with the COSMOS UI. 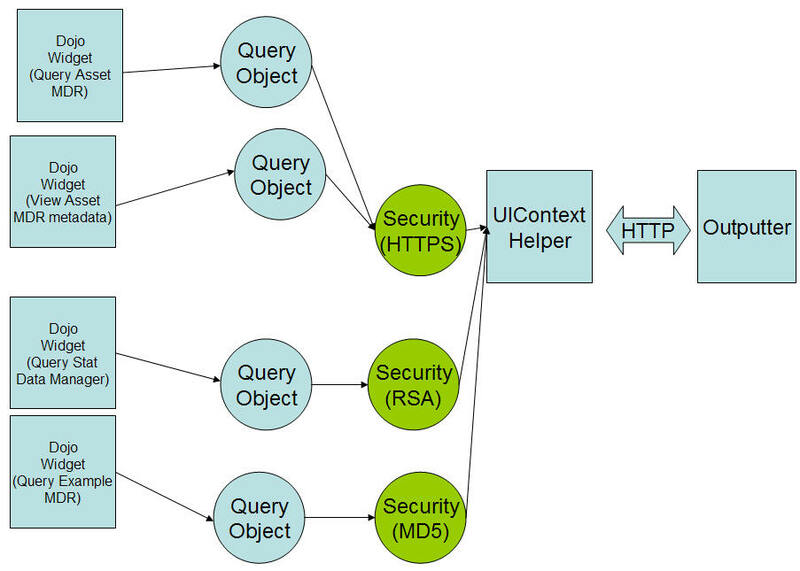 A security object can be associated with a set of query request. Note that different security objects can utilize different security protocols. Also notice that the security object can cache the username and password. This will allow the user to specify the username and password once. Subsequent requests can reuse the cached username and password. There have been discussions to define a security service on an MDR. This will allow the UI to determine if an MDR requires security authentication when sending a request to the MDR. In cases where more complex security authentication is required, a new namespace would be defined. //does this mdr support security? Another approach is to allow the end user to associate a security object with a particular Data Manager. A new menu option can be added to data manager node. The menu option will allow the user to associate credentials to the data manager node. If any request is sent to the particular data manager the associated credentials will be pass into the HTTP request. The non-COSMOS MDR extracts the username and password from the SOAP header and authenticates the request. Which use cases are relevant for Higgins? Given our timeframes, should we do a simple / custom authentication implementation for now, and bring in Higgins later when we have elaborate security requirements? Does anyone have any additional requirements at this juncture that require a 2008 delivery? Is Higgins designed for a limited-scope Security implementation that only requires authentication? Has anyone utilized Higgins for a similar scenario in conjunction with another open source (or corporate) project? The ui needs to encrypt the password using a encryption algorithm. Dojo contains MD5 encryption however there are ip issues using this algorithm that will not pass legal. This page was last modified 10:05, 23 May 2008 by Sheldon Lee-Loy. Based on work by David Whiteman, Bill Muldoon and Jimmy Mohsin.